An AOB gives the third party authority to file a claim, make repair decisions and collect insurance payments without your involvement. Review the resources below to better understand how transferring your insurance claims rights can impact you and your family. For example, you have a pipe leak in your home that causes water damage. If you call a restoration company to make repairs and sign an AOB that transfers your insurance rights to the company, the company can file a claim on your behalf and be paid directly. Is an Assignment of Benefits contract legal? How can I get out of the contract? Yes. An AOB is a legal contract. If you sign an AOB, it is legally-binding and there is no “right of rescission” or “cooling off period.” Once the contract is signed, it becomes a valid contract. The company or person you signed the contract with has the right to hold you to the terms of the contract. If you are concerned with the language or terms of the contract, you should seek legal advice prior to signing the AOB. If the third party will not agree to release you from the contract, the only recourse is in a court of law. If I have suffered damage to my insured property, what should I do first? If you have damage, you should take the necessary steps to mitigate the damages and prevent any additional damage from occurring. This would include any temporary repairs such as covering the roof or removing standing water. You should also immediately contact your insurance company to inform them of the damage and file a claim. Do not allow a third party, such as a water remediation firm or contractor, to contact your insurance company for you. You should be the one to make the first contact with your insurance company. You do not need to sign an AOB in order to get your insurance claim processed or your residence repaired. How does an Assignment of Benefits impact me, as a homeowner? You are signing over the rights and benefits of your insurance policy to a third party. Make sure you thoroughly review and understand any contracts you sign with repair companies, including an AOB. If you do not agree with the provisions of the AOB, you may be able to negotiate the provisions of the contract. You do not need to sign an AOB in order to get your insurance claim processed or your residence repaired. If you are asked to sign an AOB, make sure you read it carefully and understand clearly what rights and benefits under your insurance policy you may be signing away. Remember, this is a legally binding contract with no right to cancel after it is executed. Verify the license (if one is required) of any contractor or vendor that you hire to make repairs to your property. You should also verify the company or person’s general liability and workers’ compensation insurance coverage. Contact your insurance company directly to report the damage and set up a time for the adjuster to inspect the damages. Do not allow a third party, such as a water remediation firm or contractor, to contact your insurance company for you. You should be the one to make the first contact with your insurance company - as soon as possible. Make emergency or temporary repairs. Make an inventory of any damaged items. Do not discard any damaged items without prior approval from the insurance company. Make a list of any questions you would like to ask the insurance adjuster. Request a copy of the fire or police report, if applicable. Assignment of Benefits (AOB) is an agreement that, once signed, transfers the insurance claims rights or benefits of the policy to a third party. An AOB gives the third party authority to file a claim, make repair decisions and collect insurance payments without the involvement of the homeowner. AOBs are commonly used in homeowners insurance claims by water remediation companies and contractors. Contract for Repair is a legal agreement for repairs that outlines the scope and cost of repairs to be completed. A Contract for Repair may state a certain amount is due up front before repairs can be started. If an initial payment is required, it will be listed on the contract and state the remaining balance is to be paid upon completion of the work. Most insurance companies will honor a contract for repair and make the check for outstanding amounts payable to the policyholder and the contractor. Direct Payment Authorization Clause provides authorization for the direct payment of any benefits or proceeds to the company that is performing the work. This clause is found in an AOB and a Contract for Repair. Depending on the language in the AOB or the Contract for Repair, the third party may be able to endorse checks received from the insurance company on behalf of the policyholder for services provided by them. Also, the policyholder is responsible for payment of their deductible and any additional work requested by the policyholder not covered by the insurance policy. Power of Attorney is a legal document by which one person authorizes another person to take specific actions on behalf of that person, as stated in the document. Hold Harmless Agreement is an agreement that releases and holds a company harmless against all liability claims in the event the work is halted prior to completion. Third Party or assignee is not an insured under the insurance contract, but stands in the shoes of the policyholder through an AOB and has the authority to file a claim with the insurance company, make repair decisions and collect insurance payments without the involvement of the homeowner. View this scenario-based video to understand how signing an Assignment of Benefits may impact you as a policyholder. This downloadable brochure includes definitions, tips and information on Assignment of Benefits. View these infographics for quick tips and information on Assignment of Benefits. Know the red flags and how to protect yourself before signing an Assignment of Benefits. 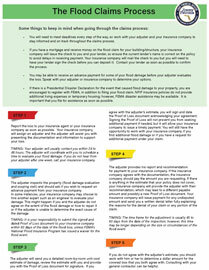 Review these consumer tips on filing an insurance claim and transferring your insurance claims rights.